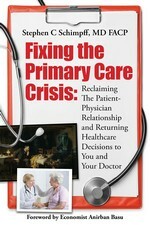 Readers of my posts know that I am a strong advocate for primary care and for granting the PCP added time per patient. Older patients in particular with both their many impairments and chronic illnesses need more time per visit. Here is an approach by a continuing care retirement community developer/manager to assure that the PCPs have adequate time for each resident, most of whom have multiple chronic illnesses. The program uses, in part, a Medicare Advantage plan to achieve its ends. Older individuals have more health concerns with many more complex chronic illnesses along with impaired vision, hearing, mobility, and cognition. Older individuals consume far more medical resources and dollars than the remainder of the population. These are individuals that one would assume are benefitted with more intense primary care with attendant preventive care, close disease monitoring and attention to chronic illnesses. The following demonstrates that assumption as correct. A large developer and manager of continuing care retirement communities sets the patient number per doctor at a remarkably low 400 for their in-house salaried PCPs. (Recall that most PCPs have at least 2,500 patients under care.) They have found that this 400 number is the ideal number of elderly geriatric patients per doctor in order to assure the quality, humanistic and integrative approach to care desired. They have clearly demonstrated that this approach to primary care with a low number of patients per doctor (and a team that functions akin to a medical home) not only gives superior care but that it results in much reduced total costs of health care overall. Most visits are for 30 minutes but can be extended as necessary. There is also a Medicare Advantage plan available exclusively to residents of the 16 communities. In this plan a resident can choose the on-site PCPs or continue with one’s own PCP, can access a wide range of specialists when necessary (many conduct office hours on site), can use most any hospital, can be driven to most off-site doctors’ offices at no cost, etc. Unlike traditional Medicare where one must spend three days in the hospital in order to be eligible for Medicare to pay for the first 100 days of residential skilled nursing care, this Advantage plan waives the required three day stay. In other words, if the resident would benefit, the doctor can make the decision and can arrange an immediate referral to their on-campus site. This, of course, eliminates a very costly hospitalization. The plan has an on-site nurse to coordinate special needs such as preparing for surgery, returning to the community from the hospital, transferring to assisted living, arranging in-home special needs care, etc. There is also an on-site benefits specialist to assist residents with their questions. The most common version of their Medicare Advantage plan costs substantially less than one might pay for both Medigap and Part D policies yet it includes greater benefits (e.g., basic dental) with few co-pays and no deductibles. According to the medical director, residents can have same or next day appointments for as long as needed, they are offered extensive preventive care. The PCPs hired in part because they are well versed in gerontology issues, and there is a strong commitment to listening. My takeaway is that when the PCPs are allotted the needed time and can listen and think, the care is excellent, satisfaction is strong, and the total costs come down substantially. It also means that the PCP can get back to relationship medicine where trust builds and healing is possible. I believe it is good that at least some organizations and insurers are beginning to realize that relationship-based care with sufficient time for each patient means better care and lower total costs. Note: I talked to the founder and former CEO and the executive vice president/medical director of Erickson Living and toured the clinic at one site, but I have no financial relationship. This program is used for illustrative purposes only and is not meant to be an endorsement. Stephen C. Schimpff is a quasi-retired internist, professor of medicine and public policy, former CEO, University of Maryland Medical Center, and senior advisor, Sage Growth Partners. He is the author of Fixing the Primary Care Crisis: Reclaiming the Patient-Doctor Relationship and Returning Healthcare Decisions to You and Your Doctor. < Previous post Want a successful digital health initiative? These 5 things need to happen first. Next post > Maternity leave for physicians is a disgrace. It’s time to fix that.